Polymer solutions are of substantial interest both in theoretical and practical point of vision since of the helpful information they can furnish. For instance, size and shape of polymer molecules can be attained from polymer solutions. Recall: Low molecular weight substance readily undergoes dissolution whereas polymers take a considerable time to do so. At low concentration, polymer solutions are extremely viscous compared to low molecular weight material, which are less viscous even at elevated concentrations. Small molecular weight materials are held via Vander waal forces or electrostatic forces. As soon as the solvent and the solute are brought mutually, the solvent molecules surround the solute molecules at the surface, establish a solvent-solute interaction and break the solute-solute attraction. As this occurs, the solute molecules that are discrete are isolated from the solid phase and as their sizes are comparable to that of the solvent molecules, they disperse fast into the solvent phase. Dissolution here is approximately instantaneous. Larger molecules weight substances (Polymer) are giant molecules contrasted to solvent molecules and are made of hundreds of sequence segments. Such long molecules aren't in the form of expanded straight chains, but are in the form of firmly folded random coils. Individual molecular coils are as well not discrete and divide but are interpenetrating and entangled through one another. There are fluctuating degrees of cohesive and attractive forces between different segments of the similar molecular coils in addition to neighbouring coils. Forces these as dispersion, induction, dipole-dipole interaction and hydrogen bonding (both intramolecular and intermolecular) hold the molecular coils and their segments mutually forcefully. This is the interaction of long chain molecules through liquids. For linear and branched polymers, liquids can generally be originate that will dissolve the polymer totally to form a homogenous solution while cross linked polymers will only swell when in contact through the compatible liquids. When an amorphous polymer is mixed with a suitable solvent, it disperses in the solvent and performs as if it is liquid. Solvents for polymers are classed as good or poor solvent. a) A excellent solvent is one which is extremely compatible through the polymer; the liquid-polymer interactions enlarge the polymer coil, from its unperturbed dimensions, in proportion to the extent of such interactions. b) A poor solvent is one that the liquid-polymer interactions are fewer and coil growth of perturbation is restricted. As we know thermodynamic principles governing the dissolution of low and molecular weight substances are fundamentally similar. Molar mass of macromolecules can be computed from the thermodynamic properties of polymer solution. The basic thermodynamic parameters utilized to explain such system relates to the Gibbs free energy function (G), to the Enthalpy (H) and Entropy (S). For the solution process, the following are defined. It is therefore possible to find out ΔGm if ?Sm is recognized. ?Sm can be computed using a liquid lattice model. Polymer solutions only approach perfect behaviour at infinite dilution although at theta (Θ) situations they exhibit pseudo-ideal behaviour. Through polymer solutions, ?Hm ≠ 0 since of interactions between the polymer and solvent molecules. As we know: The ideal solution model doesn't communicate to real solutions. T is positive and ΔSm is thought to be always positive so that the sign of ?Gm is computed via the sign and magnitude of ?Hm. If ?Hm is negative, then ?Gm will be negative and solution assured. If however ?Hm is positive, then ΔHm < TΔSm for the polymer to be soluble. In general, TΔS is so small for high molar mass polymers that if ?Hm is positive, then it must bevery small if not close to zero for the solution of polymer to be possible. Therefore solution depends on the existence of a zero or small values of ?Hm. In common, polymeric mixtures are far less miscible than mixtures of small molecule substances. This effect results from the fact that the driving force for mixing is usually entropy, not interaction energy. In other words, miscible materials usually form a solution not because their interaction with each other is more favorable than their self-interaction, but because of an increase in entropy and hence free energy associated with increasing the amount of volume available to each component. This increase in entropy scales with the number of particles (or moles) being mixed. Since polymeric molecules are much larger and hence generally have much higher specific volumes than small molecules, the number of molecules involved in a polymeric mixture is far smaller than the number in a small molecule mixture of equal volume. 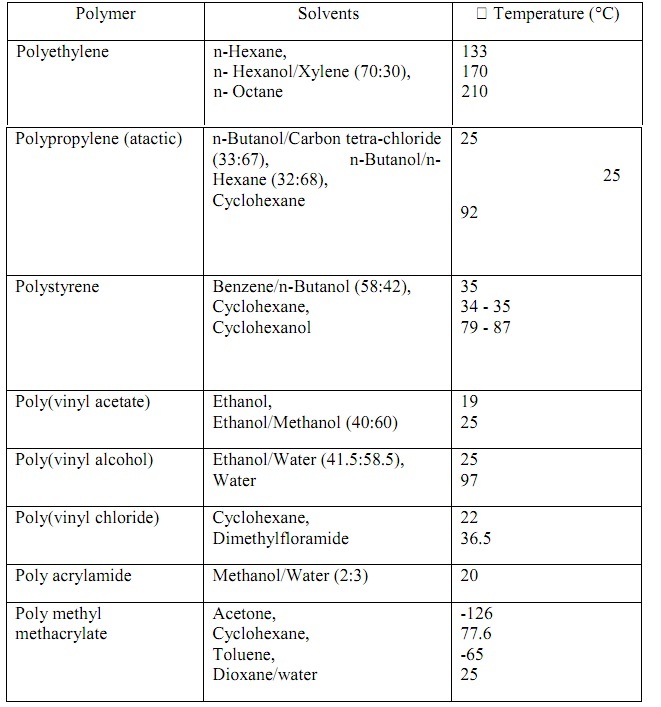 The energetics of mixing, on the other hand, is comparable on a per volume basis for polymeric and small molecule mixtures. This tends to increase the free energy of mixing for polymer solutions and thus make solvation less favorable. Thus, concentrated solutions of polymers are far rarer than those of small molecules. Furthermore, the phase behavior of polymer solutions and mixtures is more complex than that of small molecule mixtures. 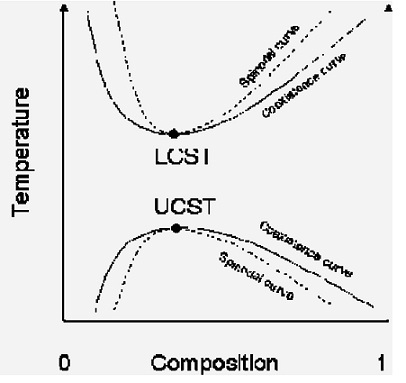 Whereas most small molecule solutions exhibit only an upper critical solution temperature phase transition, at which phase separation occurs with cooling, polymer mixtures commonly exhibit a lower critical solution temperature phase transition, at which phase separation occurs with heating. Fig: Phase diagram of the typical mixing behavior of weakly interacting polymer solutions. That not all polymers can be dissolved, and even though when they can, the dissolution process may take up to several days or weeks. It is important that a polymer does not interact with liquid with which it may come in contact during service. Also it is necessary to know what solvents attack what polymers. The solution process when a polymer is added to a solvent, takes place in two stages:- (a) The first stage which is a slow process is called solvation. Solvent molecules are absorbed on the surface of the polymer molecules. They then diffuse into the bulk of the polymer resulting in an increase in the average dimension of the polymer molecule, a phenomenon known as swelling. (b) In the second stage the swollen polymer, if in a good solvent gradually disperses to yield a polymer solution. This stage may be speeded up by agitation, though the solution process for polymer is slow. The dissolution of polymers depends not only on their physical properties, but also on their chemical structures, such as - polarity or non-polarity, molecular weight, branching, crosslinking degree and crystallinity. Cross linking degree - Solubility of a polymer decreases as crosslinking (strong intermolecular forces) increases, since strongly cross linked polymers will inhibit the interaction between polymer chains and solvent molecules preventing those polymers from being transported into solution. Crystallinity (strong hydrogen bonding) - They act like crosslinking in that crystalline polymers are swollen or softened by solvents. Crystalline polymers dissolution can be forced if an appropriate solvent is available, or warming the polymer up to temperature slightly below its crystalline melting point (Tm), for example, highly crystalline linear polyethylene (Tm = 135°C) can be dissolved in several solvents above 100°C. Nylon 6,6 (Tm = 265°C), a crystalline polymer which is more polar than polyethylene, can be dissolved at room temperature in the presence of solvent with enough ability to interact through its chains. Branching - Branched polymer chains commonly enhances solubility, even though the rate at which this solubility occurs, depends on the particular type of branching. Chains containing long branches, cause dense entanglement making difficult the penetration of solvent molecules. Therefore the rate of dissolution in such cases becomes slower. Short branches loosen up the major chain structure thereby permitting solvent molecules to penetrate. Molecular weight - The molecular weight of polymer plays an important role in their solubility. In a specified solvent at a meticulous temperature, as molecular weight increases, the solubility of the polymer decreases. Polarity or non-polarity - Polar solvents tend to dissolve polar polymers while non-polar solvents dissolve non polar polymers. Thus polar polymers should be utilized in non-polar media for example poly(vinyl alcohol), poly(acrylic acid), poly(acrylamide) and other polymers enclosing hydroxyl groups are non- resistant to water but polyethylene, polypropylene, teflon, polystyrene, poly(vinyl chloride) are resistant to water.